Soccar Do not misunderstand the title. It is not written wrongly. This is not a soccer game. 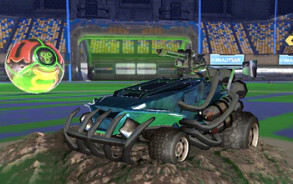 Soccar is the created name of this vehicle that was created to be used in 3G games. Yet, the race tracks may remind soccer fields. Not only the fields. You are going to play football with these specially-designed super cars. For the ones who cannot consider playing keys, there is a really explanatory introduction. Arrows will be useless. WASD keypad is going to be used combined with space bar and mouse.